Diamond and ruby floral ring remodel. This was designed and made from old jewellery. Turning unwanted jewellery into new jewellery. 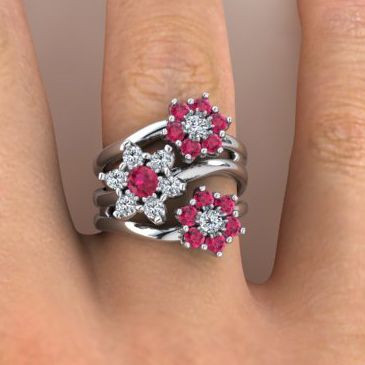 This gently curving trio of 18ct white gold bands each has a floral cluster of rubies and diamonds. The tiny flower clusters are all delicately sculpted, to create the look of real flowers.